DH and I went down to the Vancouver Home and Design Show to catch up on the trends that are new and exciting in this red-hot renovation and building market. I remember going to the show twenty years ago or so and it seems to me that it was kiosk after kiosk of handy-dandy labour-saving devices, pots and pans, with a few decorating and building companies thrown in. Or maybe that was the PNE. Anyway, the past few years you’ve been able to talk with a lot of renovation companies, plus get some great ideas about new products that are available. As usual there were great speakers — including Bryan Baeumler, Colin McAllister and Justin Ryan, lots of great chefs and designers. Small was definitely big this year. There were several retailers showing off various ways to hide beds — not just floor mounted but pieces that looked like regular cabinets but made out into beds. And Urban Barn tasked the three designers competing for their Next Top Designer with designing a dual-purpose space in just 150 square feet. I saw a lot I really liked but for me the outstanding exhibition was the NOMAD MicroHome. The display unit showed how much living and storage you could fit into a 10 foot by 10 foot footprint. 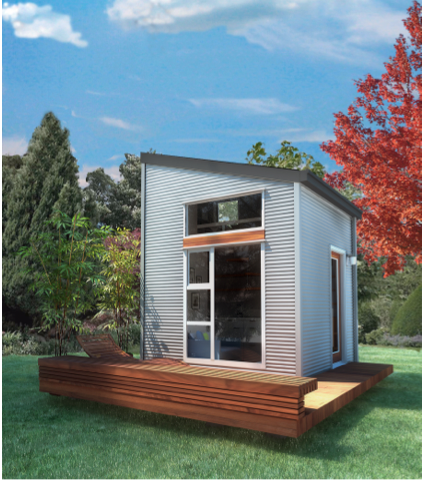 It would be great for an extra bedroom, tucked into your yard. Or, with the addition of other modules, you could easily make a nice vacation home. You can even go completely green with the addition of a Water Generation Plant, a Solar Power Plant, a Rainwater Collection System and a Grey Water Treatment Plant. And they are pretty good looking, too. While looking at the home I got a feeling of deja vu — and sure enough I wrote about the Nomad last year. It’s great to see an innovative local company moving ahead. Posted in Cities, Laneway House and tagged BC Home and Garden show, Laneway House. Bookmark the permalink. Vancouver Heritage Foundation Laneway House Tour is October 25! Get your tickets now for this year’s Vancouver Heritage Foundation Laneway House Tour! The theme is Heritage, and one of the featured homes is over 100 years old. The tour is a great way to see what laneway living looks like, and if you are planning a laneway you’ll get lots of good ideas you can incorporate into your plans. Find out more and get your tickets at the Vancouver Heritage Foundation site. Posted in Laneway House and tagged Laneway House, Vancouver Heritage Foundation Laneway House Tour. Bookmark the permalink. (Less) Power to the people! I chatted with Ian and Steve at the Home Discovery Show on CKNW about the difference in the amount of energy we use here at the laneway house. It really hit me this week when I signed up for BC Hydro’s Equal Billing. We are paying $35 a month for our electricity now, back at the condo we paid $64 a month. That’s a huge difference because even though our new home is about half the size of our old one, our condo was on the second floor of a three-storey building, so we only had two exterior walls. Now we have four exterior walls over 1.5 floors, plus a roof and deck over the entire footprint. But we don’t have to depend on lower energy bills to know our laneway is energy-efficient. Our house received an EnerGuide rating of 83 from BC Hydro. 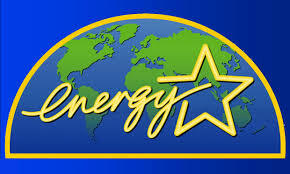 Developed by Natural Resources Canada, an EnerGuide rating is a standard measure of a home’s energy performance. A rating of 0 represents a home with major air leakage, no insulation and extremely high energy consumption. A rating of 100 represents an airtight, well insulated, sufficiently-ventilated home that requires no purchased energy. Power Smart new homes are required to achieve at least ENERGUIDE 80, higher than what’s required by the B.C. Building Code. That rating put us in the “highly energy-efficient new house” category in their rating system. This is “Offtober” at BC Hydro. Visit their site to see how you can save on special deals from retailers; PowerSmart Programs; and play contests. If you want to make some changes to your home you can take advantage of rebates and other incentives from the City of Vancouver, BC Hydro, and Fortis. Find out more about that here. If you are a low-income household you can take advantage of BC Hydro’s Energy Conservation Assistance Program. Find out more about this here. And if you just want to get started living a more sustainable life, pick up some hints here . What does all this energy efficiency mean to us? It means lower Fortis bills for a start. We pay about $25 a month for natural gas for our heating and cooking (including our barbecue). But it also means getting out of bed on a winter morning and feeling that radiant heat. It means no cold corners, no nasty drafts. It means comfort, as much as sustainability. Posted in Laneway House, Life, Minimalism and tagged BC Hydro, BC Hydro's Energy Conservation Assistance Program, Lane Home, Laneway House, Minimalism. Bookmark the permalink. Hypothetically, you may be interested in putting in a small bathroom. 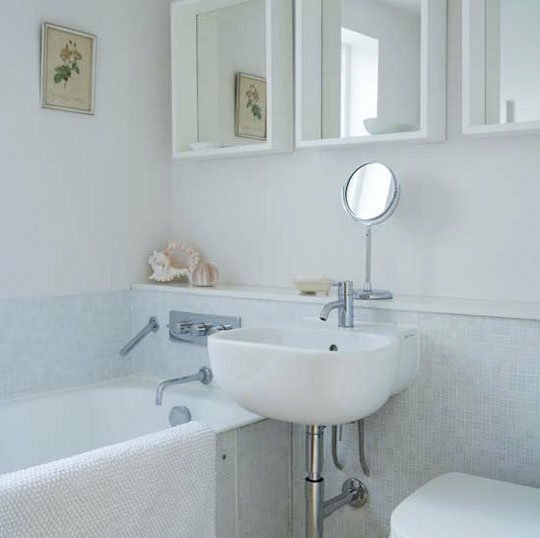 Maybe you are designing a laneway home for yourself, maybe you have an attic bedroom you’d like to link to a teeny ensuite, maybe you’re trying to fit a powder room or shower into a basement corner. I’ve told you how we solved the space problem in our laneway bath — now for some other ideas to get the most out of your restricted space. If you just can’t say good-bye to the tub, you could try a tiny one. 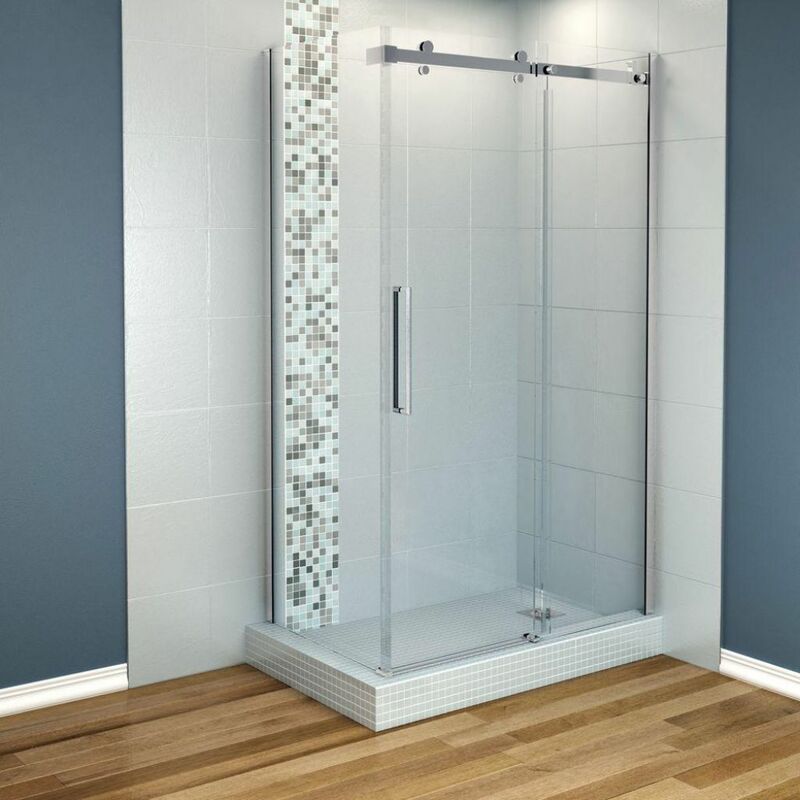 This one lets you keep the shower and tub combo. This one is loaded with luxury, and can be snuck underneath a sloping ceiling. 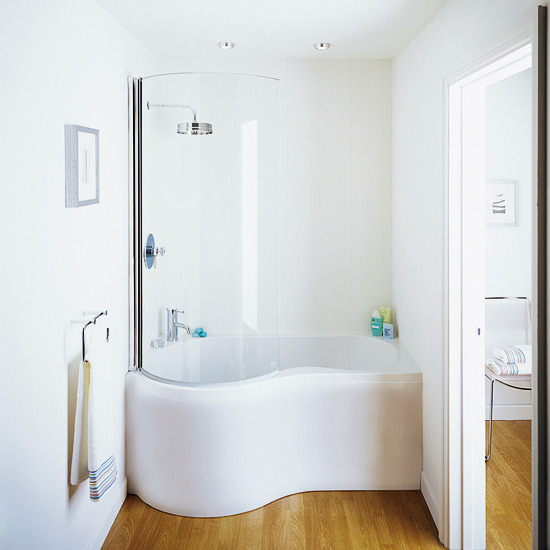 The sliding doors mean it could be snugged up tight to the toilet if you have to — no space needed for your out-swinging glass doors. 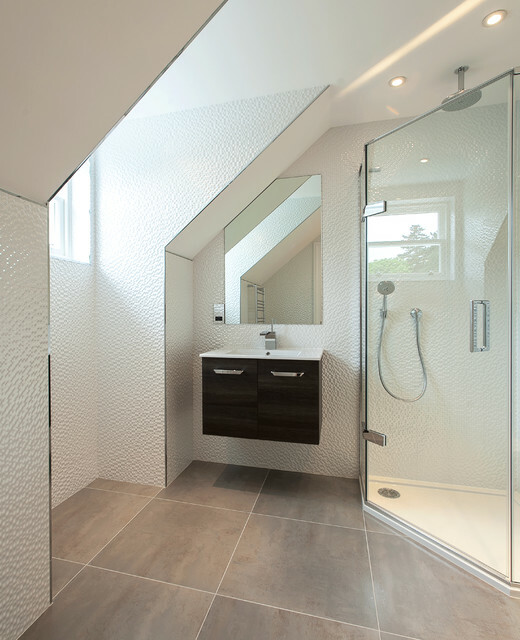 Good use of space putting the sink beneath an eave (or even a staircase) with a sloping roof. And the floating vanity makes the whole room look bigger. 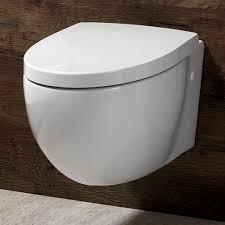 A toilet where the tank is placed inside the wall. It’s so clean and contemporary looking, and of course doesn’t take up as much interior space. But you have to place the tank space within an interior wall, and we just couldn’t make it work. Of course a tiny sink can also save you precious inches. Even IKEA sells a tiny sink. 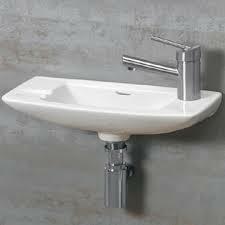 But remember, you won’t be able to build any storage beneath these sinks. 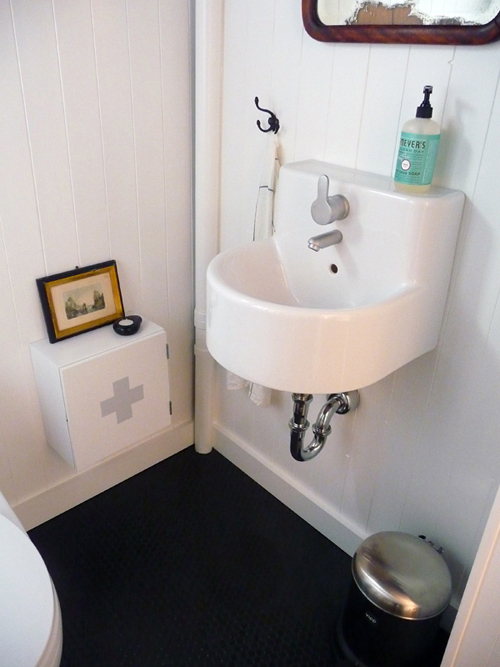 This Tiny-House architect installed a stylish sink in her shower room. 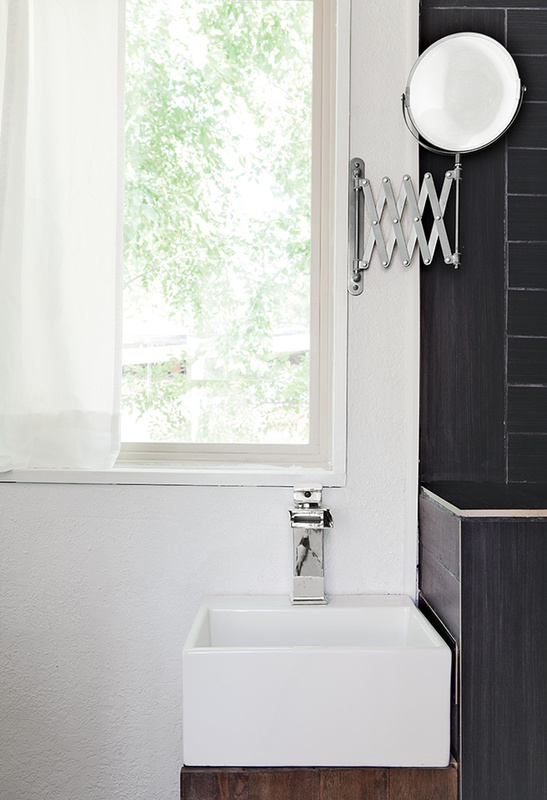 the whole home is just 196 square feet, and the IKEA mirror on the retractable arm is their only mirror. And remember that lighter coloured walls will expand the visual look of any small room. 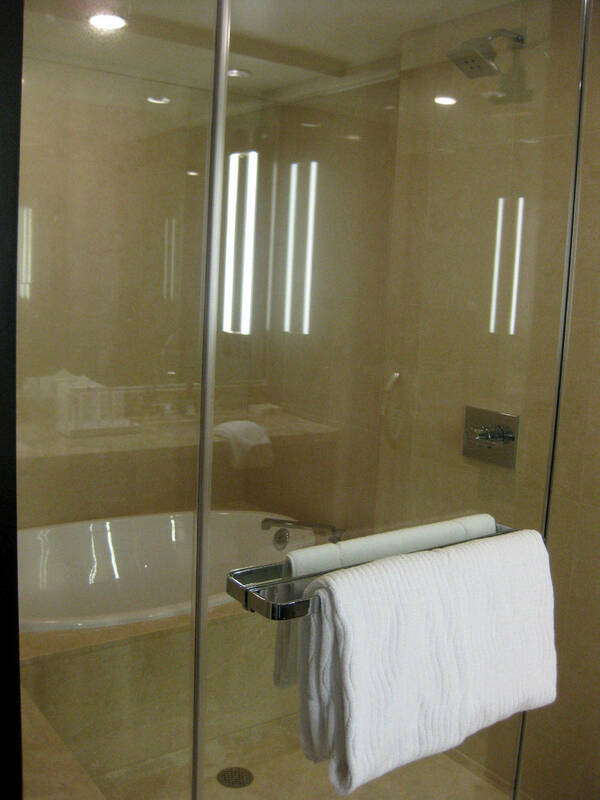 Shiny tiles, mirrors, and glass surfaces also add to the feeling of space. Keep it sleek, clean, and simple. 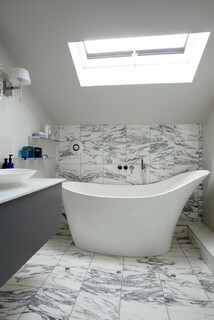 And any bath can look larger. Posted in Uncategorized and tagged Decor, Laneway House. Bookmark the permalink.